Grape VinesZone 2-9 Mature Height: 15-20 ft. Mature Width: 20-24 inches Growth/Year: 2-3 ft. Sunlight: Full Sun Soil Conditions: Moist well-drained. 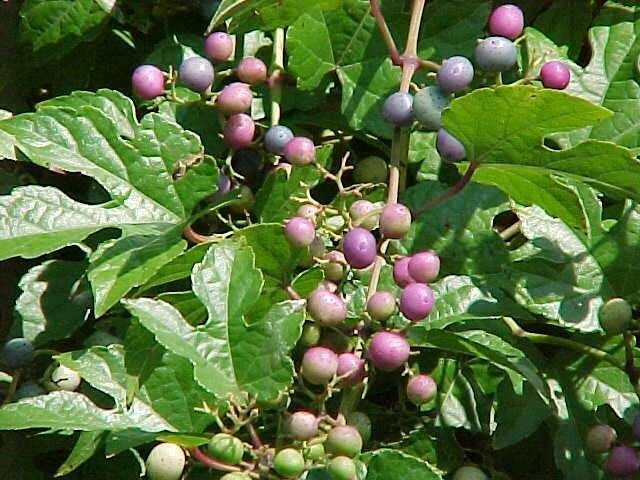 Other common names: fox grape northern fox grape plum grape northern muscadine swamp grape wild vine riverbank grape Mature Height: climbing Soil / Climate: Wild grape will grow well in shady areas but for maximum fruit yields prefers sun. Wild grape is quite hardy though intermittent frosts can reduce fruit yields. Notes: Leaves are heart shaped and 2 to 9 inches long. Fruit is dark blue to black in color and 5/16 to 1/2 inch in diameter. Wildlife: A wide range of birds rely upon wild grape for nesting and cover and even more utilize its fruit for food throughout the fall months. Currently shipping in 4'' pots.